Work is totally getting in the way of my sewing time here lately. Ha! Good thing I enjoy my job. We are at the end-of-year crunch where everything needs to be done right now and fast. Every time I check something off my list, three more things are added. But we are so close to summer I can taste it. So my sewing has been put on hold for a few more weeks. I did do a boatload of sewing over spring break, though. I was on a roll. I told someone that I was truckin' right along and couldn't stop to blog about it. Now that all sewing has stopped, I figured this was a good time to share some things I made. 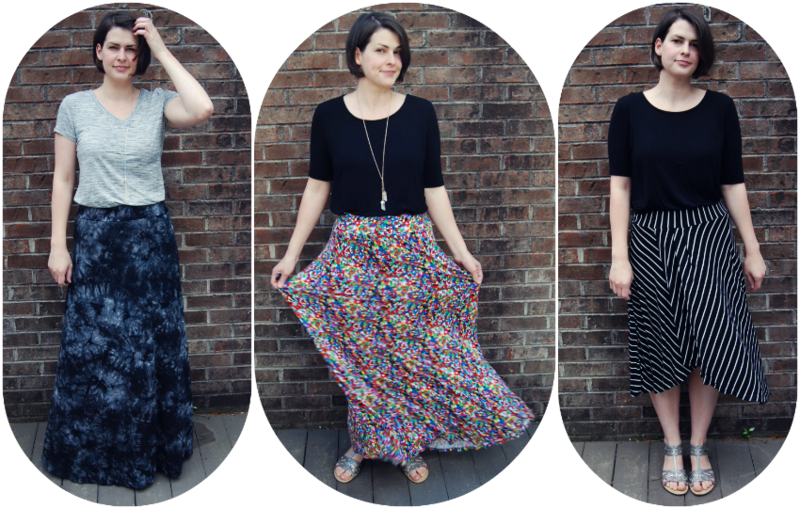 I snapped a few photos of three knit skirts I made that I wear all the time. Seriously, all the time. I think my coworkers are probably wondering if I own anything else at this point. 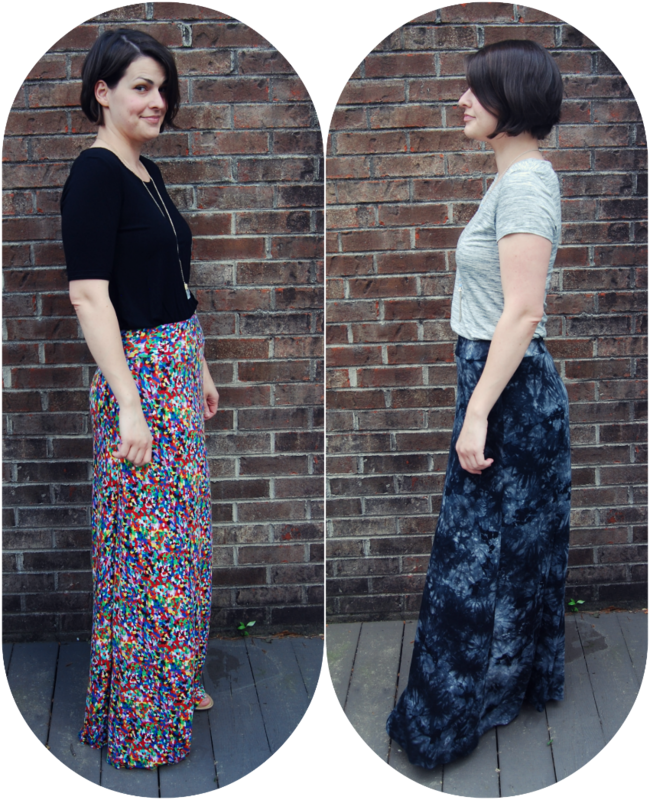 I made two more quarter-circle maxi skirts and one Simplicity skirt. The quarter-circle skirts are the ones I have the most love for. I made one last year that I still wear regularly. I know it's not the most interesting blog post but I feel like they deserve mention since they are such workhorses. 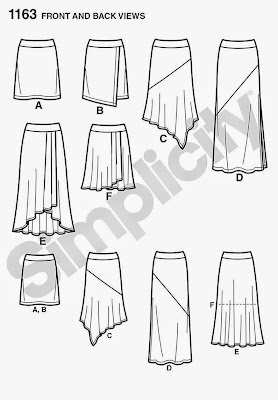 If you haven't made yourself a quarter-circle and half-circle skirt pattern, I suggest you do that and add it to your pattern arsenal. I use mine all the time. Even for switching out skirts on other patterns. 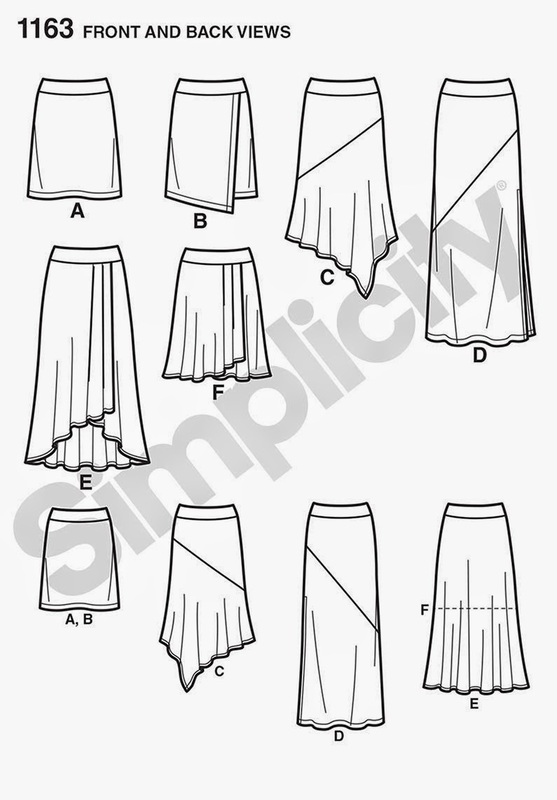 There are umpteen billion circle skirt how-to's out there, but I found this blog post from By Hand London very helpful. 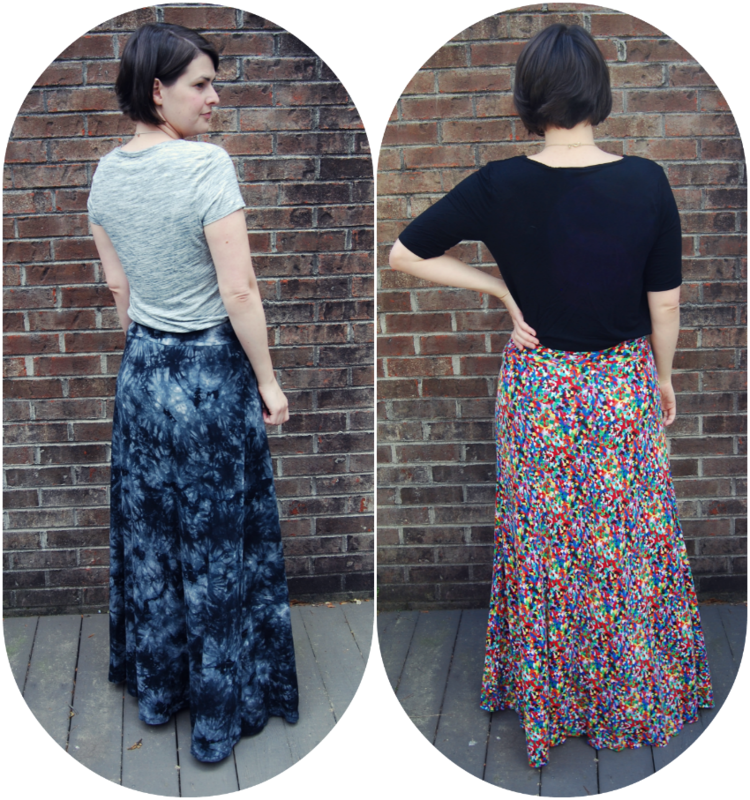 The length of my maxi skirts are 44 inches (I'm 5'9") in case you are wondering. But I do like to have the waistband jacked up high. It sits right over my belly button. I made a straight rectangular casing for two inch elastic for the waistband. I love the thick, two inch elastic for it's belly holding properties. The black tie dye fabric is a bamboo knit from fabric.com. The awesome, colorful confetti goodness is a rayon knit I spotted at Hancock. I couldn't believe my eyes when I saw it. I snapped up three yards and went home and immediately made this skirt. Another great thing about these skirts is that it only takes an hour or so to sew one up. Instant gratification. The bamboo knit is pretty heavy, so I think I prefer the drape of the lighter weight rayon knit. The bamboo knit makes some noise when I walk, actually. But I do love both skirts. 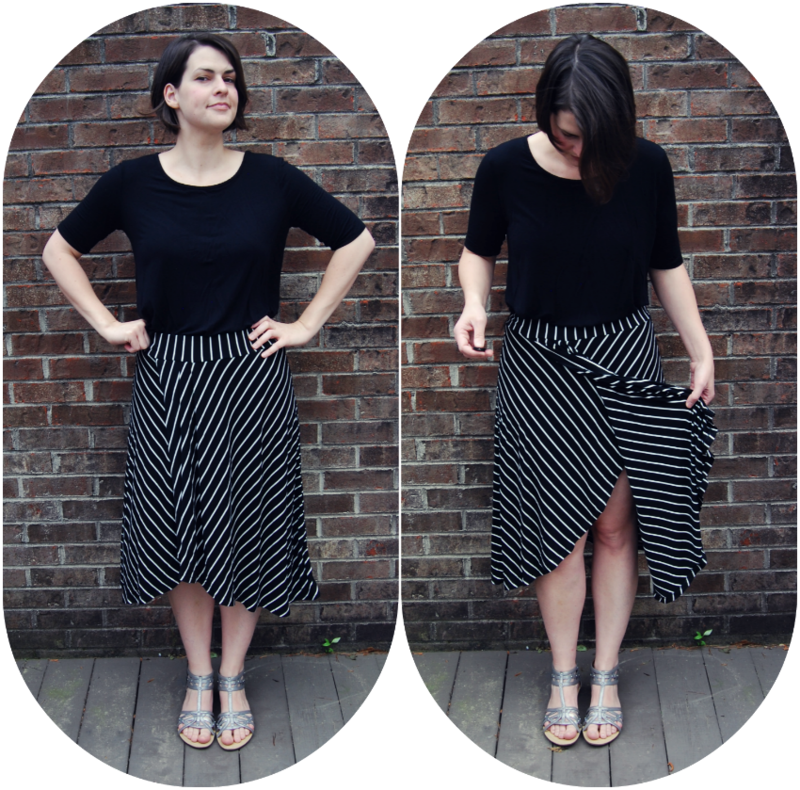 I am not as in love with this black and white striped Simplicity 1163 faux wrap skirt, despite my superman pose. But the issues lie in the execution, not the pattern. I think the pattern is a decent one. I made view E. I didn't have quite enough fabric, a bamboo jersey again, so I shaved two inches off the back piece and blended to the front hem. I did the blending part slightly unevenly, I think. I also decided to use a stripe fabric thinking I could just match up the stripe at the side seams and then let them fall whichever way they wanted to on the front. In theory, that was a good idea. But I matched stripes right at the cut edges instead of at the seam line. I realized my mistake when I went to sew up the side seams. I thought I could shift the fabric just a bit to make it work, but you can see it didn't. I am ever so slightly off at every stripe. I almost think that's worse than just being blatantly off. Anyway, I'm still wearing the skirt. But I am definitely not as proud to say that I made it. And after looking at these pictures I think I need to wear a heel with it. The length is a little frumpy. 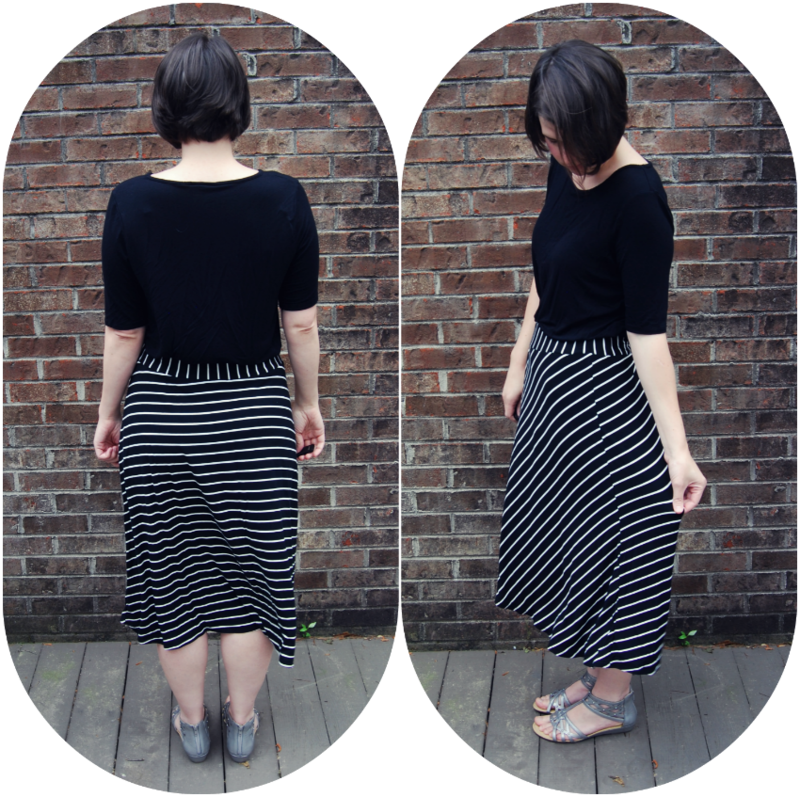 I'd love to try this skirt again in a solid red knit I have but lengthen the back of the skirt to ankle length. As soon as I'm done with school! I also just realized that I did the wrap backwards, not that it matters. Whoops. Anyway, all useful pieces. I also made a ton of tee shirts (seven!) during my spring break sewing binge that are in heavy rotation. Hopefully I can get around to documenting those, too.